United States Navy F-8 from VF-154 Black Knights. The Vought F-8 Crusader (originally F8U) was an aircraft carrier-based fighter aircraft built by Chance-Vought of Dallas, Texas. It replaced the F-7 Cutlass also from the same manufacturer. The first prototype was ready for flight in February 1955, and was the last American fighter with guns as the primary weapon. 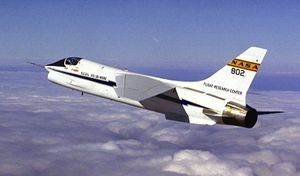 The RF-8 Crusader was a photo-reconnaissance development and operated longer in U.S. service than any of the fighter versions. RF-8s played a crucial role in the Cuban Missile Crisis, providing essential low-level photographs impossible to acquire by other means. 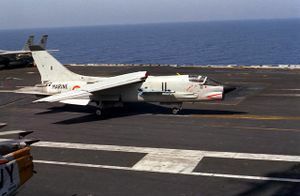 Naval Reserve units continued to operate the RF-8 until 1987. In September 1952, United States Navy announced a requirement for a new fighter. It was to have a top speed of Mach 1.2 at 30,000 ft (9,150 m) with a climb rate of 25,000 ft/min (127 m/s), and a landing speed of no more than 100 mph (160 km/h). Korean War experience had demonstrated that 0.50 in (12.7 mm) machine guns were no longer sufficient and as the result the new fighter was to carry 20 mm (0.8 in) cannon. In response, the Vought team led by John Russell Clark created the V-383. Unusually for a fighter, the aircraft had a high-mounted wing which allowed for short and light landing gear. The most innovative aspect of the design was the variable-incidence wing which pivoted by 7° out of the fuselage on takeoff and landing. This afforded increased lift due to a greater angle of attack without compromising forward visibility because the fuselage stayed level. Simultaneously, the lift was augmented by leading-edge slats drooping by 25° and inboard flaps extending to 30°. The rest of the aircraft took advantage of contemporary aerodynamic innovations with area ruled fuselage, all-moving stabilators, dog-tooth notching at the wing folds for improved yaw stability, and liberal use of titanium in the airframe. Power came from the Pratt & Whitney J57 afterburning turbojet and the armament, as specified by the Navy, consisted of four 20 mm cannon, a retractable tray with 32 unguided Mighty Mouse FFARs, and cheek pylons for two AIM-9 Sidewinder air-to-air missiles. Vought also presented a tactical reconnaissance version of the aircraft called the V-382. Major competition came from Grumman with their General Electric J79-powered F-11 Tiger, McDonnell with upgraded twin-engine F3H Demon (which would eventually become the F-4 Phantom II), and North American with their F-100 Super Sabre adopted for carrier use and dubbed the Super Fury. NASA's F-8C digital fly-by-wire testbed. 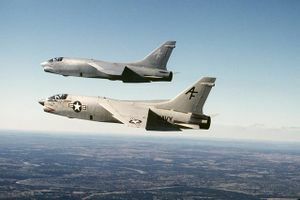 In May 1953, the Vought design was declared a winner and in June Vought received an order for three XF8U-1 prototypes (after adoption of the unified designation system in September 1962, the F8U became the F-8). The first prototype flew on 25 March 1955 with John Konrad at the controls. The aircraft exceeded the speed of sound during its maiden flight. The development was so trouble-free that the second prototype, along with the first production F8U-1, flew on the same day, 30 September 1955. On 4 April 1956, the F8U-1 performed its first catapult launch from USS Forrestal. F8U-1 Crusader BuNo 141435 & CDR "Duke" Windsor depart China Lake for a successful speed record attempt, 21 August 1956. Prototype XF8U-1s were evaluated by VX-3 beginning in late 1956, with few problems noted. Weapons development was conducted at NAF China Lake and a China Lake F8U-1 set a world speed record in August 1956. CDR. "Duke" Windsor set broke and set a new Level Flight Speed Record of 1015.428 mph on 21 August 1956 beating the previous record of 822 mph set by a USAF F-100. The first fleet squadron to fly the Crusader was VF-32 at NAS Cecil Field, Florida, in 1957, deploying to the Mediterranean late that year on USS Saratoga. VF-32 renamed the squadron "Swordsmen" in keeping with the Crusader theme. 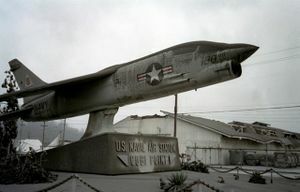 The Pacific Fleet received the first Crusaders at NAS Miramar, San Diego when the VF-154 Black Knights and VMF-122 accepted the first Marine Corps Crusaders in 1957. In 1962 the Defense Department standardized military aircraft designations generally along Air Force lines. Therefore, the F8U became the F-8, with the original F8U-1 redesignated F-8A. 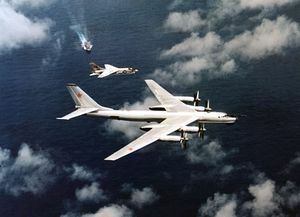 An F-8 of USS Oriskany intercepts a Tu-95 'Bear-B'. The Crusader became the ultimate 'day fighter" operating off the aircraft carriers. At the time, U.S. Navy carrier air wings had gone through a series of day and night fighter aircraft due to rapid advances in engine and avionics. Some squadrons operated aircraft for very short periods before being equipped with a newer higher performance aircraft. The Crusader was the first post Korean aircraft to have a relatively long tenure with the fleet and like the USAF F-105, a contemporary design, might have stayed in service longer if not for the Vietnam war and resulting attrition from combat and operational losses. Two Crusaders prepare to launch from USS Midway; their variable-incidence wings are in the "up" position. The Crusader was not an easy airplane to fly, and often unforgiving in carrier landings where it suffered from yaw instability and the castering nose wheel. Not surprisingly, the mishap rate was relatively high compared to its contemporaries, the A-4 Skyhawk and the Phantom II. However, the aircraft did possess some amazing capabilities, as proven when several hapless Crusader pilots were ejected off catapults with the wings folded. The Crusader was capable of flying in this state, though the pilot would be required to lose weight by ejecting stores and fuel, and then return to the carrier. The F-8 Crusader was the last U.S. fighter designed with guns as its primary weapon. When conflict erupted in the skies over North Vietnam, it was U.S. Navy Crusaders that first tangled with VPAF MiGs in August 1965. Although the MiGs claimed the downing of a Crusader, all aircraft returned safely. At the time, the Crusader was the best dogfighter the United States had against the nimble North Vietnamese MiGs. The Navy had evolved its "night fighter" role in the air wing to an all-weather interceptor, the F-4 Phantom II, equipped to engage incoming bombers at long range with missiles such as Sparrow as their sole air-to-air weapons, and maneuverability was not emphasized in their design. Some experts believed that the era of the dogfight was over as air-to-air missiles would knock down adversaries well before they could get close enough to engage in dogfighting. As aerial combat ensued over North Vietnam from 1965 to 1968, it became apparent that the dogfight was not over and the F-8 Crusader and a community trained to prevail in air-to-air combat was a key ingredient to success. Despite the "last gunfighter" moniker, the F-8s achieved only four victories with their cannon — the remainder were accomplished with AIM-9 Sidewinder missiles , partly due to the propensity of the Colt Mark 12 cannons feeding mechanism to jam under G-loading during high-speed dogfighting maneuvers. Nonetheless, the Crusader would be credited with the best kill ratio of any American type in the Vietnam War, 19:3. Of the 19 shot down aircraft, 16 were MiG-17s and 3 were MiG-21s. USMC Crusaders flew only in the South, and US Navy Crusaders flew only from the small 27-C class carriers; there weren't many F-8s. Though most kills were by Sidewinder, guns were used in many engagements in conjunction with the missile attack. The F-8 drivers had a choice Phantom drivers envied - a choice of guns or missiles. USMC crusader also operated in CAS missions. 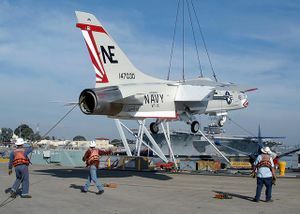 The last active duty Navy Crusader fighter variants were retired from VF-191 and VF-194 aboard USS Oriskany in 1976 after almost two decades of service setting a first for a Navy fighter. The photo reconnaissance variant continued to serve for yet another 11 years with VFP-63 flying RF-8Gs up to 1982 and the Naval Reserve flying their RF-8s in two squadrons [VFP-206 and VFP-306] until disestablishment of VFP-306 in 1984 and VFP-206 on March 29, 1987 when the last operational Crusader was turned over to the National Air and Space Museum. French Navy F-8E(FN) aboard an American aircraft carrier. The F-8E(FN) was the last Crusader produced and 42 were ordered by the French Navy (Aéronavale) for use aboard new carriers Clemenceau and Foch. The Phantom II turned out to be oversized for the small French carriers, and the Crusader was chosen. 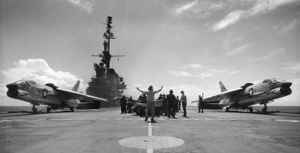 An evaluation campaign was then performed aboard the Clemenceau on March 16th 1962 by two VF-32 F-8s from the carrier USS Saratoga. The French Crusaders had the same weapons configuration as the US Navy F-8E, but had an improoved system of flaps and were modified to carry two French Matra R.530 or SRMs four Matra R550 Magic heat-seeking missiles in place of Sidewinders. 12.F squadron was reactivated on October 15th 1964 with 12 airplanes. On March 1st 1965 14.F squadron received its planes, to replace the old Corsairs. In October 1974 (on the Clemenceau) and June 1977 (on the Foch), planes from 14.F squadron participated to the Saphir missions over Djibouti. On May 7th 1977, two Crusaders went separately on patrol against supposedly French Air Force (4/11 Jura squadron) F-100 Super Sabres stationed at Djibouti. The leader intercepted two fighters and engaged a dogfight (supposed to be a training exercise) but quickly called his wingman for help as he had actually engaged two Yemenite Mig-21 Fishbed. The two French fighters switched their master armament to "on", but in the end everyone returned to his base. This was the only ever combat interception by a French Crusader. The Aéronavale Crusaders flew combat missions over Lebanon in 1983 escorting Super Etendard strike aircraft. In October 1984, France sent the Foch for operation Mirmillon off the coast of Libya, intended to calm colonel Ghaddafi down, with 12.F squadron. The escalation of the situation in the Persian Gulf, due to the Iran-Iraq conflict, triggered the deployment of the Clemenceau task force and its air wing, including 12.F squadron. 1993 saw the beginning of the missions over ex-Yugoslavia. Crusaders were launched from both carriers cruising in the Adriatic Sea. These missions ceased in June 1999 with operation Trident over Kosovo. Crusaders were renovated (but not modernized) beginning in 1991, the 17 remaining aircraft received a limited service life extension program involving avionics upgrades that included a radar-warning receiver and redesignated as F-8P (P used for "Prolonge" and not to be confused with Philippine F-8P). Although the French Navy participated in combat operations in 1991 in the First Gulf War and over Kosovo in 1999, the Crusaders stayed behind and were eventually replaced by the Rafale M in 2000 as the last of the breed in military service. In late 1977, the Philippine government purchased 35 ex-US Navy F-8Hs that were stored at Davis-Monthan AFB in Arizona. Twenty-five of them were refurbished by Vought and the remaining ten were used for spare parts. As part of the deal, the US would train Philippine pilots in using the TF-8A. The F-8s were grounded in 1988 and were finally withdrawn from service in 1991 after they were badly damaged by the Mount Pinatubo eruption and have since been offered for sale as scrap. In parallel with the F8U-1s and -2s, the Crusader design team was also working on a larger aircraft with ever greater performance, internally designated as the V-401. Although externally similar to the Crusader and sharing with it such design elements as the variable incidence wing, the new fighter was significantly larger and shared few components. XF8U-1 (XF-8A) - the two original unarmed prototypes. YF8U-1E (YF-8B) - one F8U-1 converted to serve as a F8U-1E prototype. F8U-1E (F-8B) - added a limited all-weather capability thanks to the AN/APS-67 radar, the unguided rocket tray was sealed shut because it was never used operationally, first flight September 3 1958, 130 built. F8U-2 (F-8C) - J57-P-16 engine with 16,900 lbf (75 kN) of afterburning thrust, ventral fins added under the rear fuselage in an attempt to rectify yaw instability, Y-shaped chin pylons allowing two Sidewinder missiles on each side of the fuselage, first flight 20 August 1957, 187 built. This variant was sometimes referred to as Crusader II. F8U-2N (F-8D) - all-weather version, unguided rocket pack replaced with an additional fuel tank, J57-P-20 engine with 18,000 lbf (80 kN) of afterburning thrust, landing system which automatically maintained present airspeed during approach, first flight 16 February 1960, 152 built. YF8U-NE - one F8U-1 converted to serve as a F8U-2NE prototype. F8U-2NE (F-8E) - J57-P-20A engine, AN/APQ-94 radar in a larger nose cone, dorsal hump between the wings containing electronics for the AGM-12 Bullpup missile, payload increased to 5,000 lb (2,270 kg), Martin-Baker ejection seat, first flight 30 June 1961, 286 built. F-8E(FN) - air superiority fighter version for the French Navy, significantly increased wing lift due to greater slat and flap deflection and the addition of a boundary layer control system, enlarged stabilators, 42 built. F-8H - upgraded F-8D with strengthened airframe and landing gear, 89 rebuilt. F-8J - upgraded F-8E, similar to F-8D but with wing modifications and BLC like on F-8E(FN), "wet" pylons for external fuel tanks, J57-P-20A engine, 136 rebuilt. F-8K - upgraded F-8C with Bullpup capability and J57-P-20A engines, 87 rebuilt. F-8L - F-8B upgraded with underwing hardpoints, 61 rebuilt. F-8P - 17 F-8E(FN) of the Aéronavale underwent a significant overhaul at the end of the 1980s to stretch their service life another ten years. They were retired in 1999. F8U-1D (DF-8A) - several retired F-8A modified to controller aircraft for testing of the SSM-N-8 Regulus cruise missile. YF8U-1P (YRF-8A) - prototypes used in the development of the F8U-1P photo-reconnaissance aircraft. F8U-1T (TF-8A) - two-seat trainer version based on F8U-2NE, fuselage stretched 2 ft (0.61 m), internal armament reduced to two cannon, J57-P-20 engine, first flight February 6, 1962. The Royal Navy was initially interested in the Rolls-Royce Spey-powered version of TF-8A but chose the Phantom II instead. Only one TF-8A was built, although several retired F-8As were converted to similar two-seat trainers. F8U-3 Crusader III - new design loosely based on the earlier F-8 variants, created to compete against the F-4 Phantom II, J75-P-5A engine with 29,500 lbf (131 kN) of afterburning thrust, first flight June 2, 1958, attained Mach 2.6 in test flights, canceled after 5 aircraft because the Phantom II won the Navy contract. ↑ 1.0 1.1 1.2 1.3 1.4 1.5 Tillman, B. (1990). MiG Master: Story of the F-8 Crusader (second edition). Naval Institute Press. ISBN 0-87021-585-X. .
↑ 2.0 2.1 2.2 Goebel, Greg. Crusader in Development. The Vought F-8 Crusader. Retrieved on 2006-03-07. ↑ 3.0 3.1 Grossnick, R. and Armstrong W.J. United States Naval Aviation, 1910-1995. Naval Historical Center, 1997. ISBN 0-16049-124-X. 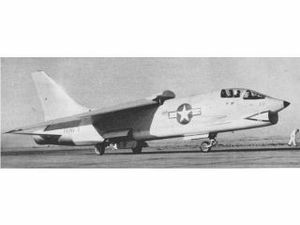 ↑ "F8U-3 Crusader III." Pike, J. GlobalSecurity.org. ↑ Winchester, Jim. Jaktplan: Världens främsta stridsflygplan från 1914 till i dag. (in Swedish). United Kingdom: Paragon Books. ISBN 1-40547-847-0. ↑ Green, W; Swanborough, G. (2001). The Great Book of Fighters. MBI Publishing. ISBN 0-7603-1194-3. ↑ Loftin, LK, Jr.. Quest for performance: The evolution of modern aircraft. NASA SP-468. Retrieved on 2006-04-22. This page was last edited on 6 March 2007, at 06:29.